Fort McMurray is taking steps to prevent another catastrophic forest fire by extinguishing a fire threat in the heart of the the city. 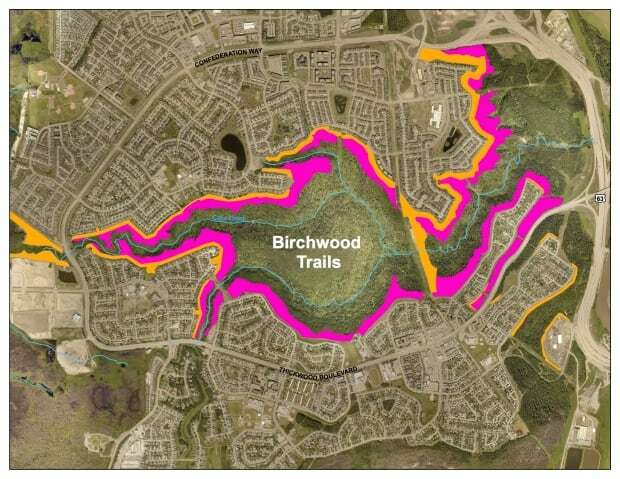 The wildfire hazard, the Birchwood Trails, has been described as a“tinder box” waiting to go up in flames. Birchwood Trails is a network of more than 130 kilometres of maintained trails sandwiched between the Timberlea and Thickwood neighbourhoods. Fire chief Darby Allen has also said he’s worried about the fire risk posed by the urban forest than by a wildfire outside the city. “It only needs one strike of lightning and we are in trouble again,” Allen said at a council meeting in July. To lower the risk, the municipality has hired Infinite Forestry Consulting to clear wildfire fuel sources along the trail. The clean-up will apply FireSmart techniques. FireSmart is a national wildfire-prevention program for communities that border on forested areas. A recent study found some of the damage caused by the wildfire could have been prevented if FireSmart principles had been adopted. “So one of the first things we do is come in and remove the dead standing trees,” said Brian Reid, owner and director of Infinite Forestry Consulting. The clean-up project will be conducted between November and February. The municipality has approved $1.5 million in spending. The municipality is implementing FireSmart techniques for managing its urban forests, but is prioritizing cleaning up its fire hazard areas at a faster rate. “We are focusing on getting that area done as soon as possible to treat it the right way and get it done right for longevity,” said Brendan Uren, a parks supervisor with the regional municipality. Uren said his department’s forestry team will be expanding from six to eight members to ensure fire risks remain low around the municipality’s 10 communities.